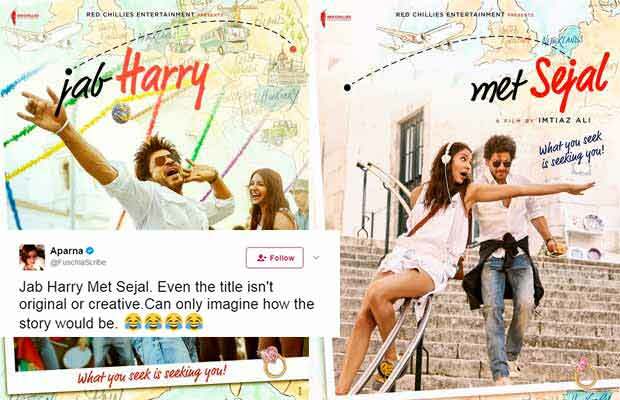 The title, Jab Harry Met Sejal is not being much liked by Shah Rukh Khan and Anushka Sharma’s fans! It was yesterday when the Bollywood actors Shah Rukh Khan and Anushka Sharma together revealed the title of their much-awaited film. Directed by Imtiaz Ali, the film has been titled Jab Harry Met Sejal. While it was after a very long wait when the fans finally got to know the film’s title, it seems that they aren’t very happy with it. Earlier the film was rumoured to be titled either Rehnuma, The Ring or Raula. But, Jab Harry Met Sejal has come as a surprise for all the SRK, Anushka and Imtiaz fans, and that also not a pleasant one! Most of the people are saying that the title has been inspired by the two famous romantic comedies – When Harry Met Sally from Hollywood and Jab We Met from Bollywood. Well, if we look at the title, it actually is very similar to these two! Although the poster looks very vibrant with Shah Rukh and Anushka enjoying together, but still some of the fans are disappointed with the title. The film was earlier supposed to release on August 11, which would have clashed it with Akshay Kumar and Bhumi Pednekar starrer Toilet: Ek Prem Katha. But now the makers of Jab Harry Met Sejal have averted the clash by changing the release date of their film and bringing it one week prior to the earlier decided date. Now the film will be releasing on August 4. The romantic drama has been widely shot in exotic locations like Prague, Amsterdam, Lisbon and Budapest. This is for the third time when Anushka and Shah Rukh Khan are coming together for a film. Before this, they have worked together in Rab Ne Bana Di Jodi and Jab Tak Hai Jaan. Previous articleDeepika Padukone’s Reply To Haters For Body Shaming Is BANG ON! Next articleRanbir Kapoor-Katrina Kaif’s Jagga Jasoos Smacks Salman Khan’s Tubelight And You Won’t Believe How!